Since March 5th 2018, the Bitcoin price had been heavily under pressure dropping by more than 20% in less than 5 days. We’ve mentioned in several weekly crypto analysis that this situation could take place and also that the Bitcoin leg up that started on February 6th 2018 is very fragile, coming after an impulsive drop. At the end of February 2018, the Securities and Exchange Commission from the United States announced a probe involving cryptocurrency exchanges and also Initial Coin Offerings. This is one of the fundamental reason why the Bitcoin price started to dip as the investors had been cautious each time news about public regulators interfering with the digital coin industry. Also, besides this negative news, the Bitcoin price had been in a good technical position for selling. We’ve mentioned several times in the last few weeks the 11,500 as a key resistance area. 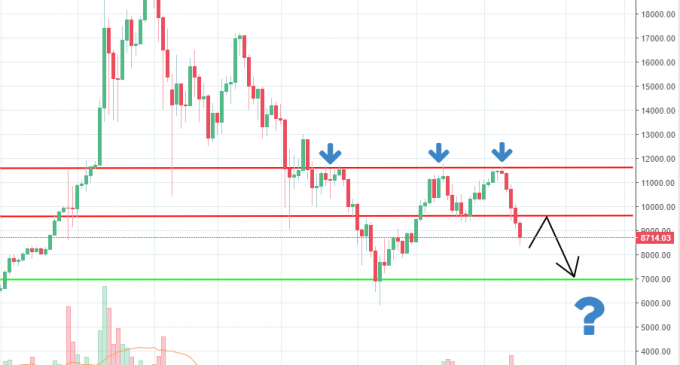 As you can see from our chart, there are already three major rejections off that level, confirming that it is a good supply zone, where strong sellers had been located. Now that the price action had dipped below the 9,600 area, we expect the price action to continue lower. A strong support area is located around 7,000 and we expect some strong buying interest to be located there. In the meantime, any negative news related to Bitcoin could further hurt the price, leading to increased weakness. Since we can see there are five consecutive red candles on the daily chart, we expect the price to continue lower. The order flow seems heavily biased towards the sell and buyers do not manage to influence the price. Last year’s performance had been hit by the regulation news, mining devices thefts and increased competition from other cryptocurrencies like Litecoin, Ethereum, and Ripple. It will be interesting to watch how Bitcoin will manage to evolve over time in order to be able to keep up with the market. At this particular point in time, there is no hope cryptocurrencies will manage to reach new record highs anytime soon.